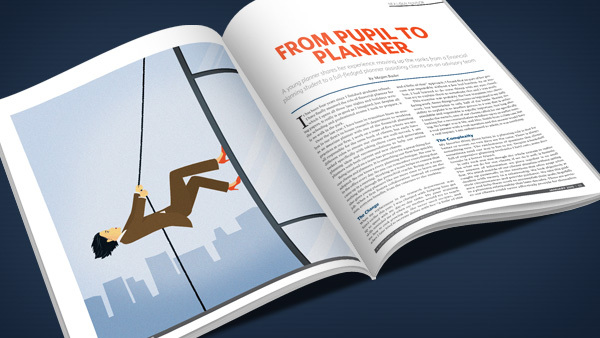 A young planner shares her experience moving up the ranks from a financial planning student to a full-fledged advisor. A junior advisor shares her story as she advances from a financial planning student to a financial planner. It has been four years since I finished graduate school. I have finally assumed the role of financial planner for which I spent all those late nights and holidays writing papers. It really is as good as I imagined, but despite all the schooling and professional exams I took to prepare, it is no walk in the park. Over the last year, I have been in transition from an analyst in our firm’s in-house research department to working as an associate planner with one of the financial planning practices at our firm. I work on a team of five where we are all responsible for the same book of clients, but each have different roles to ensure our clients are well-served. I am tasked specifically with taking client cases and generating planning ideas and recommendations to help our senior planners with both current and new clients. Being involved on a team has proved to be a great thing for our clients and planners. It is something our firm has quickly adopted. No one knows every planning technique. No one is in the office every day. No one can remember everything that came up in a meeting. Working as a team helps to ensure that nothing falls through the proverbial cracks. Being on a team also gives young planners like me more time to learn on the job. When a firm fosters collaboration instead of competition, everyone benefits, from the veterans to the rookies. When my replacement in the research department was hired earlier this year, I was charged with helping him get up to speed with my day-to-day tasks. My poor training skills reminded me of when my mother would try to teach me how to cook growing up. She never used recipes, and when I later tried to recreate dishes with her “a little of this and a little of that” approach, I found that no part of her process was repeatable without a few bad batches. As an analyst, I had learned to do some things with my eyes closed, but try to explain them to somebody else and I was stuck. This exercise was probably the best transition into client-facing work. Some things had become so ingrained in my daily work, but knowledge is only half of the battle. Having the ability to explain it to another person in a way that is understandable and repeatable is equally important. Not long after I made the switch, one of our clients called for me specifically looking for a recommendation as follow-up to an earlier meeting. No longer was it Mr. and Mrs. Smith from a class case, but a real person with a real question and the answer would have a real impact. I am embarrassed to admit, it was terrifying. My favorite thing about being in a planning role is that for better or worse, no two days are the same. There is always something new. The randomness of questions that clients sometimes send our way is fun to me. Despite a bookshelf full of expensive planning textbooks I held onto, some days Google is a better friend. It only took one run though the whole process to realize that what we do for our clients, if we do it well, is fantastic. The amount of information we piece together is no small feat. We stand outside of our clients’ situation without getting caught up personally in the emotions that often erupt when dealing with money in a relationship. We look objectively at their circumstances and provide guidance. We take this guidance and help them work to accomplish their goals, hopefully in a planning relationship that lasts decades. These are services our clients could never effectively provide for themselves. I particularly enjoy our first meeting with a new client. We walk through the personal financial data they have collected and begin the process of getting a complete look at their current financial picture. I do feel a little guilty when they hand it over though, knowing that if my husband and I were personally tasked with collecting our own documents, one of us would end up in the deep recesses of the attic before we found half of it. Even from the first step of data gathering, you can tell a lot about new clients and what they really need. Some show up with a file of documents catalogued and organized to match the order of our document checklist. Some come with a shoebox full of items covered in coffee stains and crayon. Some are still looking for things six months into the process. There is no cookie cutter process that can successfully catch all the nuances that come from working with real people. Each time around is different and provides new challenges. Being involved in the planning process is not without its challenges. Watching my teammates try to protect clients from themselves has proved to me that what we do is much more difficult than I imagined. As with anything in life, you can come up with the most well-intentioned recommendations, but despite our best efforts sometimes clients still make poor decisions. It is never easy helping to prepare for a meeting with a client who has an obvious cash flow problem or working a rebalance for a client who refuses to part with a poor investment choice from years past. Sometimes there are deeper personal issues that are obvious even to the most analytical mind. Money is not just numbers, but counseling techniques do not often come easy for planners. Another difficulty has been managing client expectations. If only my team had the secret for how to deliver outsized annual returns without ever losing clients’ money, this would not be an issue. It has been a common occurrence for our new clients to fill out a risk tolerance questionnaire as if they were extremely aggressive only to get their current account statement and find the entire balance invested in cash. I wish we could do more to gear them toward expecting portfolio returns that equate to plan success. It seems as though we live and die by a portfolio return number that is generated every three months with little thought given to how that number impacts their complete financial picture. Refocusing expectations in this arena seems nearly impossible considering that they are bombarded each night with the day’s market performance, not the current success or failure of their personalized financial plan. One area in our firm where young planners are working to improve their planning skills and find creative ways to meet these challenges is a lunch group made up of the next generation. We call ourselves the Farm Club. We all have the education to be financial planners, but most of us are still honing our craft working on teams under other senior planners. We get together and have friendly discussions about how our different teams work and function. These lunches are a sounding board for everything from client meeting styles to advances in planning software to honest discussions about ways to be taken seriously in this profession without having any gray hair. I am doing what I always set out to do, but there is still so much more to improve upon and learn. I would love to become better at the behavioral aspects of our day-to-day work. It is easy to see when clients exhibit bad financial behaviors, but effectively helping them recognize and correct them is not so easy. I still feel the gap between academia and practice. When I spend time with former classmates who have made their career in financial planning academia, I sometimes feel like I am spending time on the dark side. Yet I also find myself wanting to ask them, “Can you not just make me a better risk tolerance questionnaire and maybe also a decision tree for how to diagnose and fix clients’ behavioral biases?” I am tempted to think they are just one more paper away from solving all of our client behavior problems, but neither camp will be able to improve these planning issues alone. We will have to work together. These past four years have been an interesting ride. I would not trade the apprenticeship model I chose over the sink-or-swim version for anything. Working with a team has given me the opportunity to be exposed to complex planning cases I would never have been able to attract on my own as a new planner. At the end of the day, no matter how much longer the preparation is compared to a meeting, I love the feeling you get from knowing that you have made a very stressful part of families’ lives a little easier by providing them with objective financial advice. That is what really matters.